AUSTIN, Texas — Bevo XIV, the mascot of the University of Texas, will not make the trip to Dallas this weekend for the AT&T Red River Rivalry because of "a life-threatening condition still being explored by his veterinarians," according to statement released by the Silver Spurs, the honorary service organization charged with caring for the mascot. One of the most recognized mascots in college sports, Bevo XIV has been the university's mascot since 2004. “Bevo is a fighter, a symbol of strength and who fans across the world care deeply about," Silver Spurs executive director Ricky Brennes said. "We are carefully monitoring Bevo’s condition at this time and will update the public as we find out more about his condition. 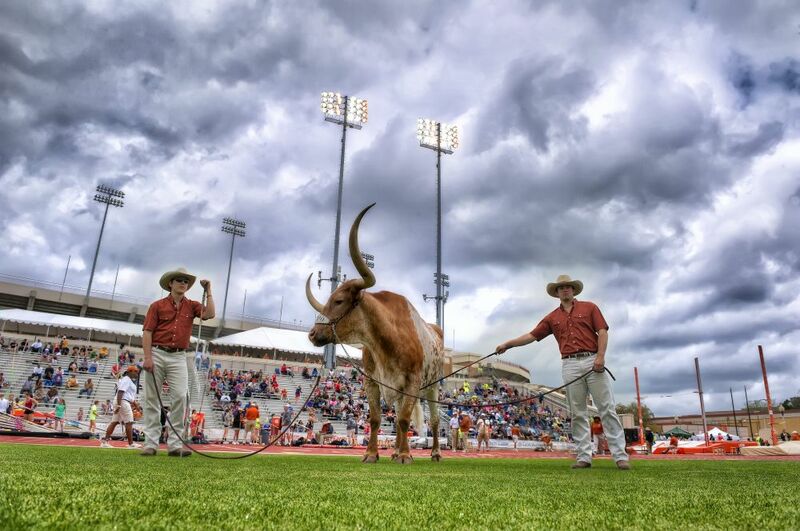 The safety and well-being of Bevo XIV is always our primary concern, and therefore he will not be attending the game on Saturday." A national grand champion show steer, Bevo has been something of a good luck charm for the Longhorns, who won 25 of the first 26 games at which he has appeared and 106 of 147 since he took over as the school's mascot. During his stint on the sideline, UT also has won seven of 10 bowl games. In the last two years, he has helped raise more than $250,000 for the University of Texas Neighborhood Longhorns Program, the primary charity of the Silver Spurs.